Last summer was a dragonfly summer. Countless dragonflies zipped and zoomed in glorious flashes of color and startling aerial acrobatics. What wasn’t fabulous was the reason for their huge population upsurge: A vicious swarming plague of mosquitoes. UGH! Ah well… here we are in deep mid winter, and now it’s just the memories of the dragonflies that are a pleasure, without the nasties of the mozzies. 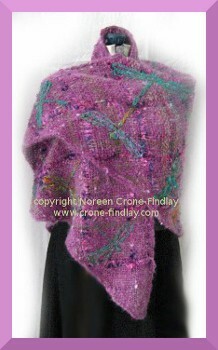 I wove it with handspun wool that has shots of silk and angelina in it. 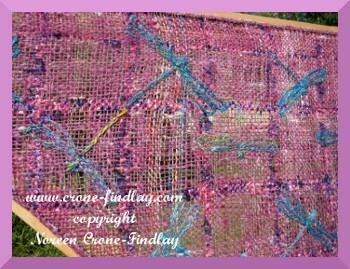 I also included rows of eyelash yarn every 28 nails, which gave me the perfect grid for embroidering the dragonflies. 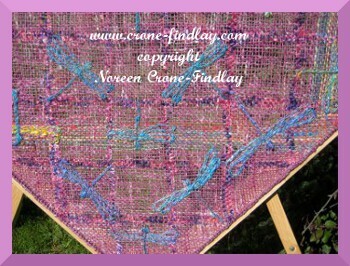 I embroidered the dragonflies onto the shawl while it was still stretched on the loom- the loom is the perfect embroidery hoop! It is definitely a one of a kind, as all the combination of elements that came together to make it just won’t happen again. 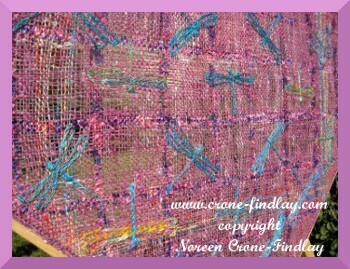 When I was doing the embroidery, I turned the loom every which way to make it easier to get to each square. 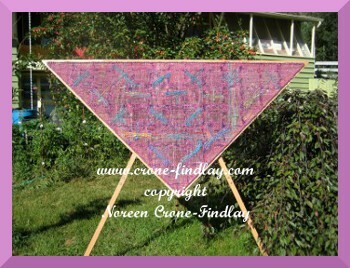 The dragonflies are embroidered with silk that I spun on my support spindle. I didn’t use a pattern or drawing to embroider the dragonflies. 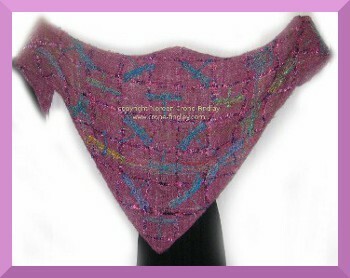 I don’t like fringes on shawls- so I spool knitted a looooooooooooooooong cord, and stitched it onto the shawl while it was still on the loom. That was wonderfully easy! I held the spool knitted cord up against the outside of the nails, and ‘v’ (baseball stitch) it to the shawl.